Slow down. In our fast-paced world, the tendency is to go fast and break things. That’s fine in some parts of the business world (like tech development). But in content marketing, I’m an advocate for a slower, more deliberate approach. A slower approach is armor against burnout, dejection, and (ultimately) the erosion of confidence in the amazing power of a content program. Why is this important? Because too much content marketing is still near-sighted. And brand-centric. And a bit uninspired and boring. I say this with love in my heart, but that’s the sad truth. Many of us haven’t spent the necessary time developing three things: 1) A brand story. 2) A content marketing mission statement. And 3) A unique and recognizable tone of voice. And then we haven’t taken the next step: To craft content that sustains not just the business. But also sustains ourselves as marketers. Q: What was the inspiration for your book? I couldn’t find what I wanted: A book that functions for marketers as part writing and story guide, part instructional manual on the ground rules of ethical publishing, and part personal training on muscle-building processes and habits. Q: What is the key concept behind your book? 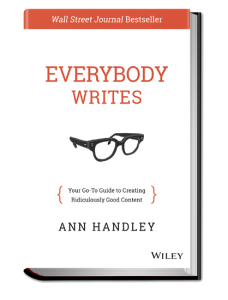 The key concept is essentially articulated in the title of Everybody Writes: In our social world: Everybody is a writer. Including you and me. Why is that important? Because words matter. Your words (what you say) and style (how you say it) are your most cherished (and undervalued) assets. The key to becoming a better writer isn’t in magic or innate gifts. Rather, the key to being a better writer is embracing some fundamentals, and getting a little inspiration and practical, accessible guidelines. Here’s a handy Writing GPS I developed to light the path, too. Q: What do you want readers to take away from your book? Oops. I should’ve read through these questions before answering. Because I think I just answered #4 in #3, above. Scene: An elevator. Two people stand awkwardly, facing forward. One is me. One is a stranger. Me (with gusto): “I help marketers be more creative, inspired, and legit. Within the context of a larger organization, or on behalf of their own businesses. Few people know Don Murray, a Pulitzer Prize-winning journalist and longtime writing teacher at the University of New Hampshire. His books are on par with anything any so-called name writer ever produced, and he greatly influenced how I think about writing (as less hard work than mysticism). I wouldn’t be in marketing any longer if it wasn’t for David Meerman Scott. When I first read this book in 2007, it opened my eyes. It connected what I’ve always done (build audiences) to what marketers now need to do. It shifted my thinking and evolved the possibilities I saw in marketing. Thank Cheezits. Otherwise I’d be playing the accordion in the subway. Q: What is the biggest challenge that you’ve had to overcome? In other words, I’ve learned a lot from the mistake of not trusting myself (and other mistakes I’ve made). So not to get too philosophical, but would that still categorize them as true mistakes? Or are they now instead small turning points that have accumulated into a kind of wisdom? I guess I’ll have to ponder that on my time… not yours. I have an irrational fear of flying (but still I do it all the time). I’m a terrible procrastinator (but still I get a lot done because I also have a strong work ethic). I’m an introvert (but I play an extrovert easily, until suddenly I can’t and I need to go lie down on my bed for three days). That I both loathe and love public speaking. Pretty much at the same time. I am incredibly social and yet also fiercely private. I value people and relationships above all but I am weirdly attached to my little dog, Abby. tl;dr: I’m a walking paradox. Aren’t so many of us? HIGH-FIVE! Q: Is there a piece of content, a social media campaign or a marketing campaign that you worked on that you’re particularly proud of? I don’t publish anything I’m not proud of. Which means I publish less than most. Is that a bad thing? Is anyone still reading? If so, then I’d add a THANK YOU. I knew I liked you. 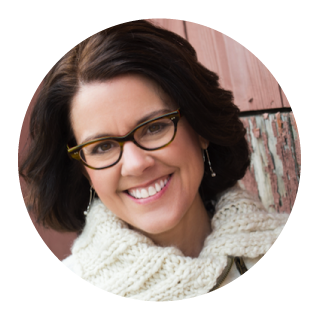 Please connect with me on Twitter (@marketingprofs, @annhandley) or Facebook or Instagram (@annhandley). Or anywhere at all. And thank you, Heidi Cohen!